The Metabolism and Mitochondrial Research Core provides access to Seahorse XFe 96 technology, as well as additional services that include technical advice in experimental design, data analysis and basic training. The Core also provides affordable access to high performance, electrochemiluminescence immunoassays using MESO QuickPlex SQ 120. This instrument provides unparalleled sensitivity and dynamic range using low sample volume, simple protocols, and fast, well-organized results. You can multiplex biomarker and cytokine assays, test for immunogenicity or toxicity, or we can help you develop your own unique assays. In addition, the Core provides PDH activity and quantity assay, Citrate Synthase assay, Cytochrome C assay for your mitochondrial research. XFe96 Extracellular Flux Analyzer: Simultaneously measure the two major energy pathways of the cell - mitochondrial respiration and glycolysis - in live cells, in real time. MESO QuickPlex SQ 120: a high performance, multiplexing imager for electrochemiluminescence immunoassays. A shift between respiration and glycolysis is observed in several pathological states including cancer, obesity, diabetes, and mitochondrial, cardiovascular, and neurodegenerative diseases. Cellular bioenergetics also play a role in aging, immune response, hypoxia and drug toxicity. Our core provides comprehensive services for analysis of metabolism and mitochondrial function in the research setting. 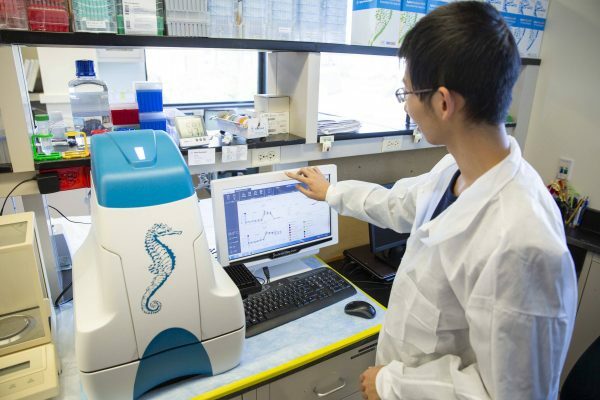 Instrumentation includes a Seahorse XFe96 Extracellular Flux Analyzer for simultaneous measurement of Oxygen Consumption Rate (OCR) and Extracellular Acidification Rate (ECAR) in order to interrogate changes in oxidative phosphorylation and glycolysis in cultured cells, isolated mitochondria, islets or small tissue samples. This bioenergetic analysis allows testing multiple conditions per assay well and direct, simultaneous comparisons across wells, enabling faster throughput with smaller samples compared with traditional respirometry methods. The Seahorse Flux Analyzer also measures bioenergetic phenotyping and analysis for all sorts of samples. The maximum amount of time per run is 3 hours (including cartridge calibration). It is the responsibility of the user to ensure that the sensor cartridge be hydrated overnight prior to use. The Core has a non-CO2 incubator which can be used for preparation of the cartridge. Appointments for use of this instrument can be made by. Training is required before use of this instrument. Individual consultation and training may be scheduled by contacting the Core. First time users should contact at least 2 weeks before running an experiment. All services include use of the Seahorse Prep Station liquid handling system and non-CO2 incubator, cartridge hydration on the day prior to the assay, and technical assistance. Users are responsible for preparing media and injection reagents, performing media exchanges, loading the assay cartridges, running the assay, and analyzing the data. All new users require training. A list of the materials required or recommended to run a successful XFe96 assay. This basic procedure describes recommendations for seeding adherent cell types for XF assay in the XFe96 Analyzer. This basic procedure describes the recommended procedure and conditions for hydrating an XFe96 Sensor Cartridge before running the XF assay. This basic procedure details the preparation of assay media for use with the XF Cell Mito Stress Test Kit, and XF Glycolysis Stress Test. This procedure describes the procedure for replacing growth medium with assay medium for adherent cells grown in XF96 cell culture microplates prior to being assayed using an XFe96 Analyzer. This basic procedure provides cartridge loading instructions for XF assays on the XFe96 Analyzer. This basic procedure details the six different concentrations of FCCP required to determine the optimal FCCP concentration for use an XF assay. Measure: glycolytic capacity, glycolytic reserve, and non-glycolytic acidification. Measure: Basal respiration, ATP-linked respiration, H+ (Proton) Leak, Maximal Respiration, Spare Respiratory Capacity, and Non-mitochondrial respiration. MESO QuickPlex SQ 120 is a compact, affordable multiplexing imager with exceptional performance offering affordable access to high performance, electrochemiluminescence immunoassays. This instrument uses Meso Scale Discovery (MSD)’s proprietary MULTI-ARRAY technology to provide unparalleled sensitivity and dynamic range, simple protocols, rapid and continuous reads, and fast, well-organized results via DISCOVERY WORKBENCH assay analysis software. They require no customer calibration or maintenance, no complicated fluidics, and no between-read cleaning. You can multiplex biomarker and cytokine assays, test for immunogenicity or toxicity, or develop your own unique assays. The technology makes the process fast, simple, low sample volume requirements, and minimal consumption of reagents. Meso Scale Discovery immunoassay kits provide highly sensitive, precise, and accurate results across a wide dynamic range with fast, efficient processing. For all available assays, please check out the following website. Electrochemiluminescent labels generate light when stimulated by electricity in the appropriate chemical environment. This reaction is incorporated into our immunoassays to provide the light signal used to measure important proteins and other biomedical molecules. High binding carbon electrodes in the bottom of MULTI-ARRAY and MULTI-SPOT microplates allow for easy attachment of biological reagents (10X greater binding capacity than polystyrene). MSD assays use electrochemiluminescent labels that are conjugated to detection antibodies. The labels are called SULFO-TAG, and allow for ultra-sensitive detection. Electricity is applied to the plate electrodes by an MSD instrument leading to light emission by SULFO-TAG labels. Light intensity is then measured to quantify analytes in the sample. High sensitivity: Multiple excitation cycles can amplify signals to enhance light levels. Broad dynamic range: The wide dynamic range of our detection systems means high and low expression levels can be measured without multiple sample dilutions. Low background: The stimulation method (electricity) is decoupled from the signal (light) allowing only labels near the electrode surface to be detected. Easy to use: Immunoassay method similar to conventional ELISA, but quicker. Great flexibility: Labels are stable, non-radioactive, and conveniently conjugated to biological molecules. Unsurpassed performance and quality: Electrochemiluminescence is a highly successful detection system that achieves clinical quality data in a variety of sample types, including cell supernatant, serum, plasma, and whole blood. The Core will develop and conduct customized assays upon request and instrument availability.